I have loved traditional Amish quilts ever since I can remember so I finally decided to make one for myself. After making the initial color choices and piecing the center bars, I realized I did not have enough cotton fabric for the borders. One more happy quilting 'accident' found just the right colors of Radiance sateen fabric in my stash to finish the top! 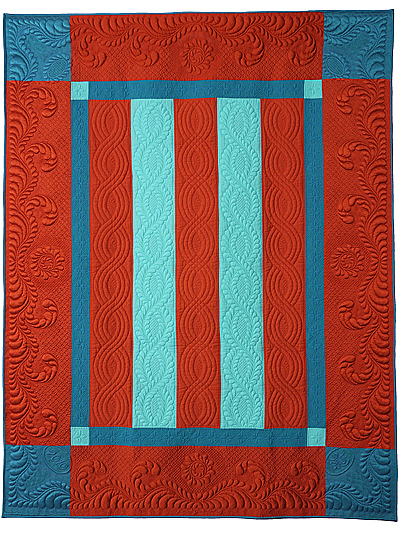 I developed the quilting to fit the top based on traditional Amish as well as my favorite feather designs. A single layer of trapunto was used in the center bars and double trapunto used in the outer border to frame the quilt.